This event is styled on the Broadwater Classic concept with the event combined with the sailing division. As we do up river, we will have a race tailored to the conditions with activities ashore following the race. Unfortunately, we had strong Southerly winds on the day and decided to cancel the race at 2pm. 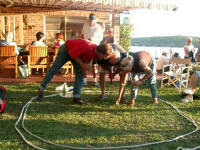 However, the race was conducted and placing's were decided by the throwing of coins. 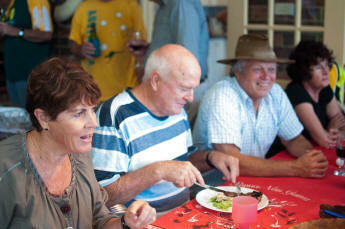 The BBQ went of successfully under the direction of Splinter, and about 70 enjoyed the food and prizes. Timed Start from 2pm: Entries and times below. Entry: Please email by clicking here. Give details of numbers, Skippers name and any children attending or SMS details to 0418 253 479. Entry Fee: $10.00 per Head (over 18) to be donated to CSC Support and Rescue Boats and collected at BBQ from Skippers for their crew. Conditions: The novice skipper or skippers must be in control of the rudder at all times and must not have won a race previously. Venue: The lawn area at the RMYC from 4-6pm. Prizes: A presentation will be held after with lots of prizes. 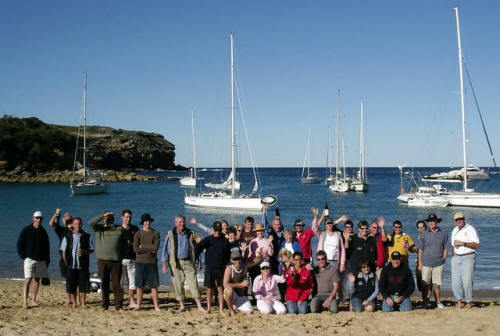 BBQ: The RMYC Sailing Division will provide all competitors with a sausage sizzle with our compliments. Drinks: Are available from the bar. This is an event where yachts can choose when to come and leave as they wish but subject to tide. However, we will organise a big BBQ diner at the Audley pavilion on the Saturday night. We expect the tables to be suitably decorated, and would welcome a small act or contribution from each table. Boats should make their way to Pool Flats and anchor stern it as per the photo. Do not tie up to trees. There will be some form of entertainment provided by willing volunteers, and no doubt cricket or boule on the grassy area by the boats. There is plenty to do whilst at this beautiful location including walking, rowing and dining at the excellent restaurant now under the old dance hall. Thanks John, Once again we gathered at Audley for the Annual Christmas Celebrations, although the numbers were a little down there were still 7 boats and we had an absolutely GREAT time. The weather was kind to us and the night festivities were really good fun. We played games, decorated the tables, heard poems and were awarded prizes for almost everything. We welcomed a new family to the club with Chris and Charlie and their two girls Tessa and Harry on Secret Water. Thanks to John Barter for organizing this event a big thank you to Margaret Barter who was the entertainment Manager a job really well done. Suggest Leave Port Hacking Thursday 3rd October for the Harbour and return by Tuesday 8th October to fit in with racing program. The best plan will be to make our own way to the Harbour based on weather and personal circumstances. A list of boats interested is shown (under) and we can make contact via mobile phone to organise meeting on the harbour or overnight arrangements. The current plan will see RAN and visiting warships rendezvousing in Jervis Bay, NSW by 2 October 2013 to conduct final preparations and briefings. The formal aspects of the IFR will commence with all tall ships entering Sydney Harbour on Thursday 3 October 2013 and all warships entering on Friday 4 October 2013 - exactly 100 years after the first RAN Fleet entry. The Ceremonial Review will take place on Saturday 5 October 2013. The Review will include a moving line of seven RAN ships to further symbolise the 1913 entry. 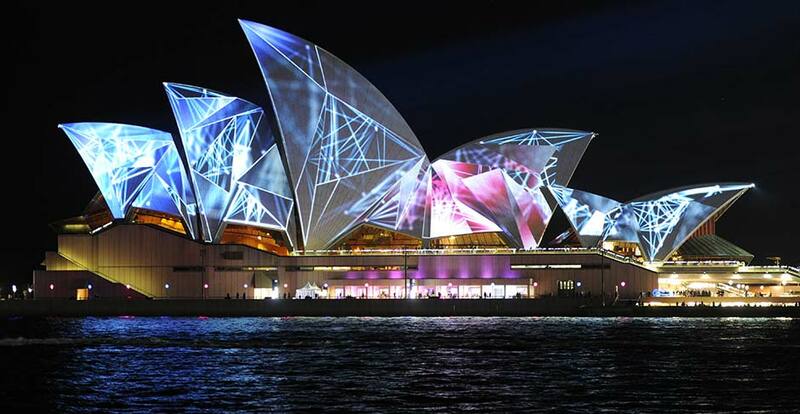 The day's events are also likely to feature formation fly-pasts by fixed and rotary wing aircraft, naval displays and demonstrations, naval gun salutes, dragon boat races and naval band performances, and will culminate in a spectacular evening pyrotechnics and light show on the harbour. As in the past (See completed events) we will muster off Jibbon beach at 11am. A call will be made 3 days prior to the above dates to advise whether suitable to go and which activity. 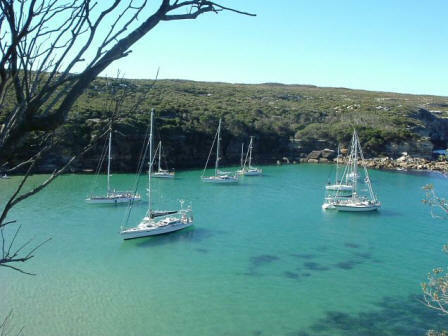 All being well buoys will be laid to guide yacht into Wattamolla. New boats will be paired with an experienced yacht and all yachts entering must listen on VHF 73 for instructions. Sunday 7th July, only a few of us ventured to Wattamolla but what an absolutely glorious day and those unable to attend missed a great day. The sky was blue with no clouds, the sun shone, the seas were slight and the whales were everywhere. We had 15 sightings on Possible Dream, admittedly some would have been the same whales but wow they are surely heading North. Two very cheeky whales were within 15 meters of our boat as we negotiated the Southern reef into Wattamolla, we thought maybe they were coming in to join the party. Four boats were there, L'attitude, Possible Dream, First Light and Pied Piper, and also Korvanton with the Crocker family on board, they had their fishing lines out and actually caught a fish, however, it needed to be returned to the ocean. There were no shore games but each boat partied on and a GREAT time was had by one and all. We all left for home at about 2.45 and had a very calm motor sail home and again witnessed whales although quite a distance away. Yachts Interested (8): L'attitude + Kick Back + Moring Mist + Seeka, Possible Dream + Sunflower + Imogen,Pied Piper, Korvanton, First Light. L'attitude made the trip on two occasions (by land yacht). Suggest we plan to leave on Thursday 6th June and return on Tuesday 11th June (Between Wednesdays over the June Long weekend). Maybe we could base ourselves at the CYC? A BBQ and Picnic will be available after the race. Please bring folding chairs if possible. Street address: Corner of Wareemba Place and Turriell Bay road, use inclinator to boatshed. This year the theme will be your choice, but we hope to hear some moving Anzac stories. 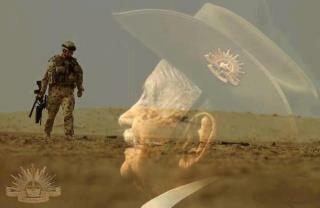 It could be a poem, it could be a story, It could be good old Australian food prepared in the Anzac way. There is bound to be a few rounds of two up sometime during the day. As well as the bottle entry for the Broadwater Classic, a bottle will be required from each couple not participating with a presentation. The best performances will receive a prize (guess what)? Please click here for a contribution from Ross H.
1st Possible Dream, 2nd Hands Off, 3rd L'attitude, 4th Chinook, 5th Caloola, 6th Shortfaced, 7th Pied Piper, 8th First Light and 9th Reflections. This Anzac Day we were blessed with absolutely glorious sunshine, clear blue skies and (unfortunately) very little wind. 9 Yachts entered the Broad Water Classic and attempted to sail the course, with so little wind it was a very slow and at times a very frustrating race. 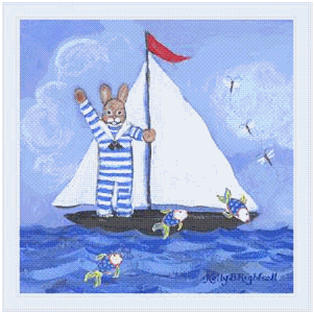 Every yacht, at sometime, was totally becalmed. The sailors then went ashore to meet with the Land sailors and proceeded to enjoy food of all sorts, which we was washed down with Ice Cold Beer, White and Red Wine and lots of good cheer. Poems, songs and stories were told and of course Anzac Day would not be Anzac Day without the game of “Two Up”. Saturday 30th March - Easter Weekend is ON The Boatshed Cafe has been booked for lunch. The idea is to plan your arrival at La Perouse for 12:30pm. The tables are currently booked for 49 guests at 1pm. I expect light winds up and back. If you don’t sail/motor up use your land yachts. The Boatshed Cafe is fully licensed -	It is not a BYO. It will be a 3 course fixed menu with choices costing $55.00 per person. Please pay me or show me your receipt if paying directly. The drinks can be purchased and paid for as you go. We will overnight at a location to be decided over lunch, and hopefully share a suitable breakfast in good time on Sunday morning. The forecast for Saturday is for a light westerly before a change to the NE. With a light southerly forecast for Sunday, it may be a good idea to return to the Port after Luncheon, but this will be discussed over lunch. Your browser does not support inline frames or is currently configured not to display inline frames. In glorious sunshine, but little wind 9 boats left Port Hacking heading for Botany Bay. It was mainly a motor sail and once all at anchor, the flotilla of “Rubber Duckies” headed for the Boat Shed Restaurant. Here 49 sailors united for an extremely nice luncheon. Three courses and a few Red’s, Whites and Beer later we all parted, the sea sailors back to their vessels and the land yachts heading for the highway. With a light north/easterly we sailed home and deciding that we had, had such a GREAT day we all headed for our moorings and our land homes. Due to weather the race was cancelled. 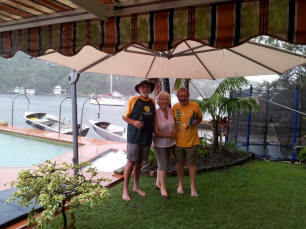 However, the BBQ was on around 1pm for those that braved the weather to come for the BBQ and hear the poems and stories. This year we will again perform the typical Australian yarn. It could be a poem, but ideally a spun yarn told by yourself or played. If you have a yarn on tape or CD let me have it in advance so it can be played over the sound system. If you need help see me (I have plenty on tape for you to choose from). It needs to be a good Australian yarn - one that takes your fancy and one with a twist. As well as the bottle entry for the Broadwater Classic, a bottle will be required from each couple not spinning an Australian yarn. The Mistress baked damper in the fuel oven, and everyone managed to cook on the BBQ. Once lunch settled the stories flowed. First we had Kevin read the History of Australia according to Hagar. Hi Bartergal Master, Copy of mystical reading as requested. Hope no one is offended, if so so I will refer all complaints and libel matters to the Master. 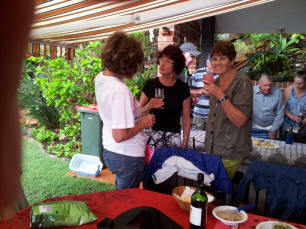 Thanks for the great day and BBQ at the Broadwater Yacht Club. Then Leslie read a story by Tony on Ancient History and Traditions dating back to 1013. Ian and Margaret reminisced with their poems of Horses and Carts plus A cup of coffee. John and Margaret, Thanks once again for a great day. Whether the weather be fine, Or whether the weather be not, Whether the weather be cold, Or whether the weather be hot. Thanks for another great day John and Margaret Rhonda and Ian. Click here for our Poem, Ian provided most of the pictures. This was finished with scones, jam and cream fresh from the oven. Click here for recipe.